My new approach was to thin it down … but that could mean dropping some comforts and not having everything I need. I took out the Nato Parker ( fleece lined) and got a large polar fleece hooded poncho and sprayed it with water proofing compound on the outside. Took out the water purification tablets ( that had expired anyway ) and kept the potassium permanganate for the purpose of cleaning water. put in extra foil …. I felt compelled to reply to this post. FIRST: the BOB is not a live indefinitely in the woods bag. It’s to allow you to escape. Having Just 2 days worth of food is a death wish. Your main problem is that you don’t have anyplace to bug out to. Safe area..
Get rid of all the junk. Replace with food. Your nit gonna be chipping and chopping wood, building shelters— your gonna be running. Hers the link to my latest bug out bag book. What are the trigger events that will force you to bug out? Do you have a supply cache waiting for you? How do you deal with predators–the two legged variety. How long can you sustain yourself without a campfire. These are the questions that should have been part of your survival planning in the first place. 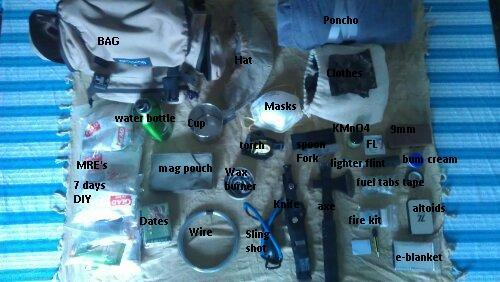 It Serbs that you didn’t plan, you just built a bug out bag. I’ll help you after you read me book. It’s free!! Its not a BOB, its a get home bag . I need to walk the 35 odd km’s home should the highway get jammed in a SHTF. I need a pribar … thats what the axe/pribar/hammer is for… getting through locks, etc that may hinder me. sling shot is for fun mostly ,and scaring off stray dogs and maybe even bagging a bird or two.. I’m a crack shot. poncho is in case it rains … and like I said it get cold at night. the food is not such a big deal .. I have gone for days without it before ..
the 3 knives are cause I like to always have 3 knives… one fixed in the bag, one folder with multiple blades and one tiny folder for delicate work..
Average unhindered walking speed is 3 miles per hour on level pavement. It would take 8 hours of steady walking to reach the destination. Everything just went down the crapper. The countryside is crawling with other people bugging out. Trespasser are shot on sight. It’s getting dark and starting to rain. There’s a massive civil uprising ahead of you. People with machetes and guns are everywhere. 35 km is a long hike friend. Food, water, shelter,and protection. These are the basics. Everything else is a waste of time. Best advice. Take your get home bag and actually go out and do what it is you plan to do. Then consider how often you will use all those tools and under what circumstances. Sorry for the typo. Damned iPhone.